Mrs. Leslie said individuals must have a valid driver’s licence, good reading, writing and communication skills, computer literate, able to work long flexible hours, lift at least 75 pounds, hardworking and have the ability to make swift decisions. 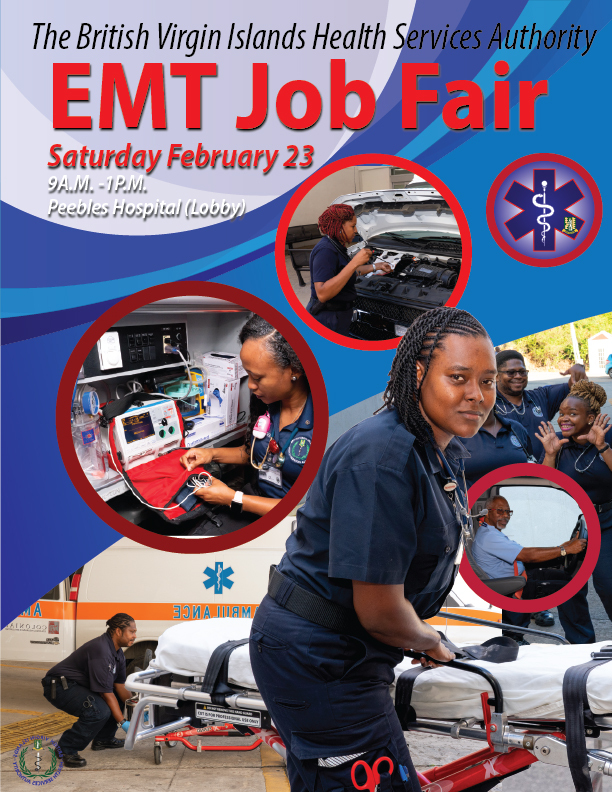 Interested persons are asked to attend a Job Fair on Saturday, February 23 from 9:00 a.m. until 1:00 p.m. in the lobby of the new Peebles Hospital. Job seekers must be dressed in business attire equipped with the relevant documents including a police record, two letters of recommendation, copy of your High School Diploma and a copy of the picture page of your passport. “Our HR team will be conducting interviews and assessments, so we want persons to bring their A game,” Mrs. Leslie said adding that while those persons with experience are welcomed, the authority will be training all successful applicants in accordance with hospital standards. Emergency Medical Technicians provide out of hospital emergency medical care and transportation for critical and emergent patients who access the emergency medical services (EMS) system. They have the basic knowledge and skills necessary to stabilise and safely transport patients ranging from non-emergency and routine medical transports to life threatening emergencies. EMTs function as part of a comprehensive response system under medical oversight and serves as a critical link between the scene of an emergency and the health care system.